I am not normally a huge fan of fish. It is just too…. well fishy. My husband absolutely loves fish of all kinds and has spent years trying to win me over with fish recipes. This is one of the first recipes I have gone back for seconds on. 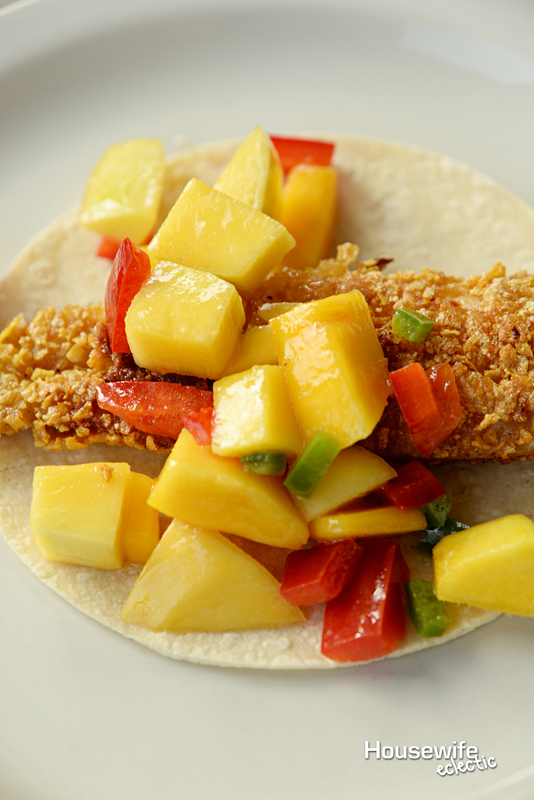 It is light, crispy with the perfect touch of mango. 1 1/2 c. chopped, peeled mangos. 1/4 tsp each salt and black pepper. 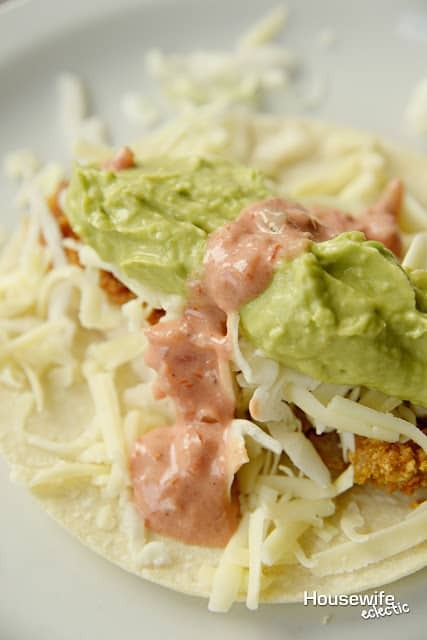 For the fish: Coat the tilapia in coconut flour and then place it in an egg wash. Coat the tilapia in gluten free bread crumbs and let the fish sit in the fridge for 5-10 minutes to help set the crumps. Place in an oiled pan with a small amount of lime juice. Rotate the fish every few minutes until it is golden brown. For the salsa: Combine the olive oil, lime peel, lime juice, vinegar and seasonings in a bowl. 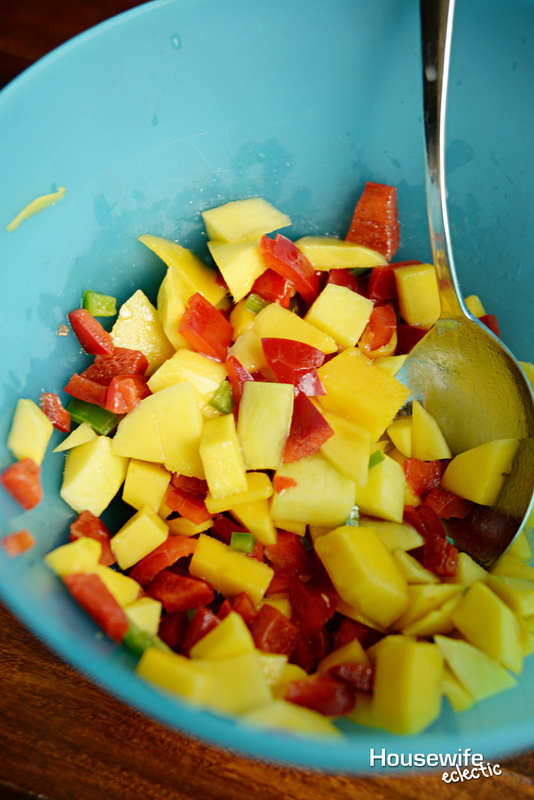 Toss the mangoes, green onions and peppers into the dressing and coat thoroughly. For the sauce: Make sauce by combining equal amounts ranch dressing and chipotle sauce. Assembly: Place a small amount of fish in a corn tortilla. 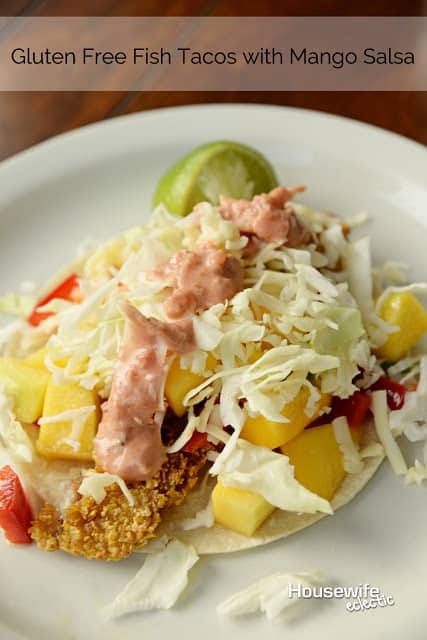 Top it with finely chopped cabbage, shredded cheese, the chipotle saucce and mango salsa. Finish the taco out with a light spray of fresh lime juice. Who would you make this for?